There’s no turning back now from METTA YOGA’S YOGA ADVENTURE IN AFRICA, February 26-27-28, 2010. This is the ad that will appear in the September-October issue of Yoga Chicago magazine. 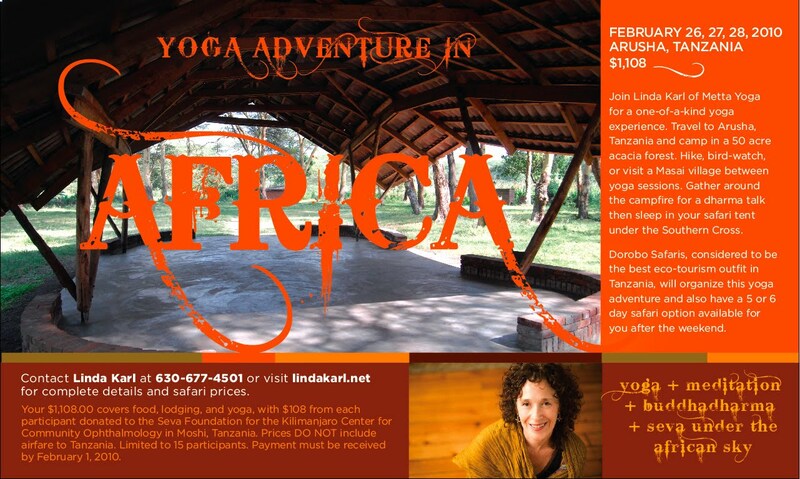 For complete details about the yoga camp and two safari options, see here. A Midwest winter can be rather brutal, at least it can be in the Chicago area. So you have your choice: a Chicago winter or OMing in a private acacia forest under the African sky. Congratulations, that's a HUGE step to take and very exciting. If its at all possible to come along, if the stars and my finances align, I'd love to come. what a fabulous opportunity! Yoga & adventure with a great teacher, what more could we want! exciting! the ad looks great. I was wondering what your professional opinion is on these 2 teacher trainings (if you have one)? thanks for responding on my blog. I'm going to read up a bit more on White Lotus, and i ordered his book and their DVDs (all in the name of research, of course! ).